Hummingbird hawk-moths are among nature’s best mimics, having been able to emulate very close physical similarities with hummingbirds. Size: These moths are medium to large. Wingspan: Their wingspan is around 1.6-1.8 in (40-45 mm). Color: They have orange-brown hindwings, visible during flight, and grey-brown forewings. The bodies are checkered black and white. 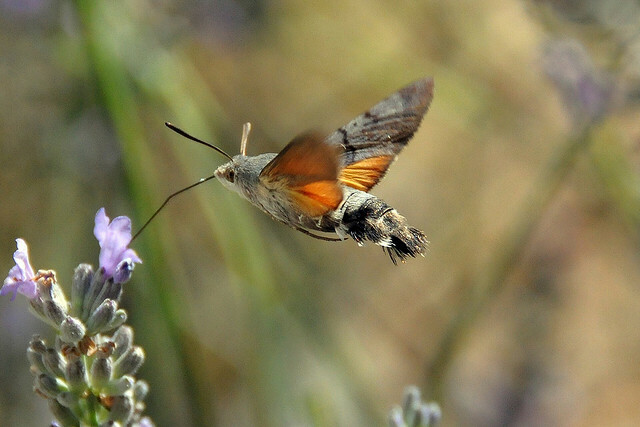 Hummingbird hawk-moths are found in Africa, Asia, Europe, the Indian Subcontinent, Mediterranean, and the UK. They can also be spotted in North America, particularly around Texas, California, and Utah. They survive in coastal and garden areas, as well as in woodlands and urban settings. These moths are active during the day, especially during bright sunshine. They also fly at dawn, dusk, and also when it is raining, at times during which most insects stay at rest. 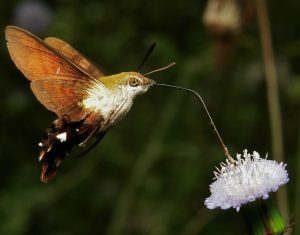 They hover and sip nectar from flowers by hovering near it and sipping the nectar with their long tongues, called proboscis; this makes them visually very similar to hummingbirds. Even the sound generated from the fast beating of the wings resembles that of the bird they are named after. They are migratory insects, and during the summer they can be found virtually anywhere in the Northern Hemisphere, especially in warmer areas. Adult hummingbird hawk-moths can be seen sipping nectar from flowers of plants such as Centranthus, Jasminum, Nicotiana, Buddleia, Viola, Verbena, Stachys, Primula, Syringa, and Phlox. The caterpillar feeds on bedstraw, madders, Rubiaceae, Centranthus, Stellaria, and Epilobium. Females lay up to 200 shiny pale green spherical eggs on the plant Galium. The eggs hatch around 6-8 days. 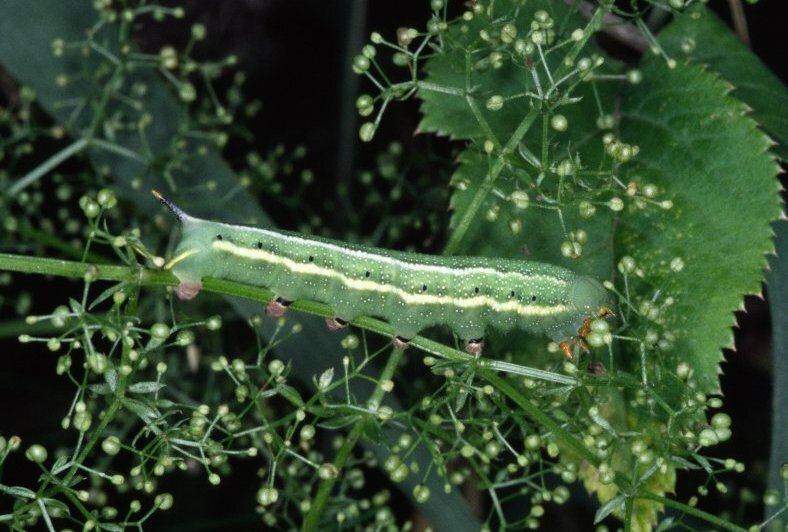 The larvae that hatch from the eggs are yellow and achieve the green color after their second instar. They stay in the larval, or caterpillar stage for around 20 days, after which they move on to the pupa stage before becoming adults. Adult hummingbird hawk-moths live for around 7 months. The colors of this insect render it invisible to the eyes of predators, despite its size. The long proboscis helps them sip on the nectar of flowers. Strong wings help them to hover around flowers while they sip on the nectar, as well as fly at speeds of up to 12 mph (19 kph), making it one of the fasted moving insects in the world. 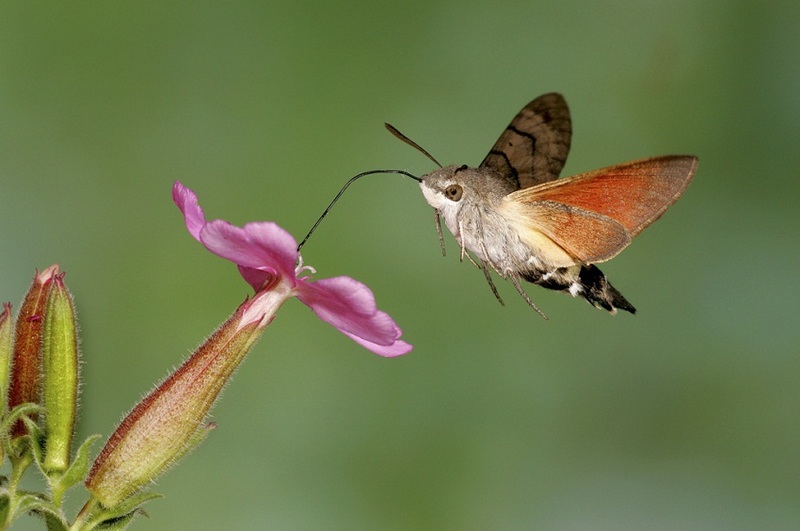 Bats, owls, spiders, rodents, and other birds of prey may attack and feed on hummingbird hawk-moths. 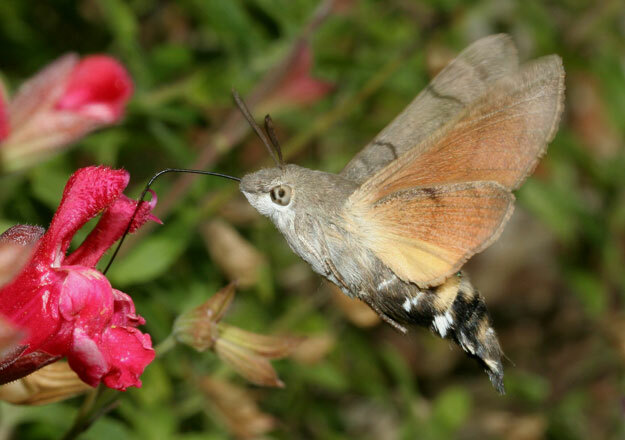 The hummingbird hawk moth has not been assessed by the IUCN yet. The similarity between the hummingbird hawk-moth and hummingbirds is believed to be a result of convergent evolution wherein two species belong to separate families and having no apparent relation with each other develop to be very similar. This is called homoplasy, which is the copying of physical structures, which appear to be are functionally the same. 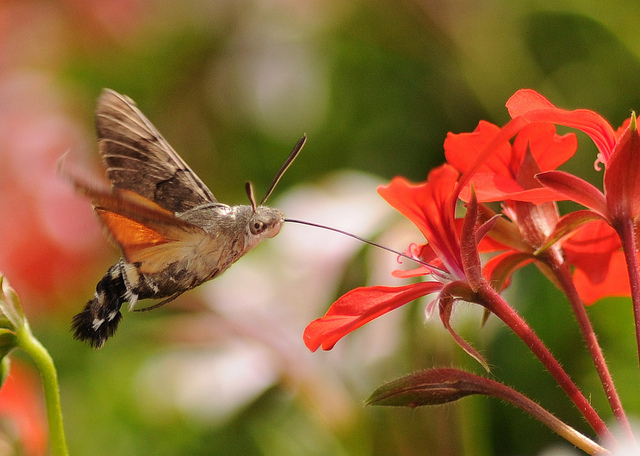 Hummingbird hawk-moths are considered to be a lucky omen. During the Normandy landings on D-Day in World War II, a swarm of these insects was flying across the English Channel, and the armada saw this, and the operation turned out to be the beginning of the fall of Nazi Germany. Moths like this one are not dangerous to human beings as they do not sting or bite. The relationship between this insect and Dianthus flower is that of mutualism, where the moth helps in the pollination. 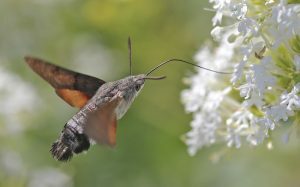 Yesterday I saw a hummingbird hawkmoth for the first time in my 88 years. It was hovering over my newly planted Buddlia but its wings were almost transparent. To day no sighting so far but I do have bats as lodgers!! Perhaps that is why. Your website is the first I found where I could identify my little visitor.so Thank you.